On 4 September, Cardinal Vincent and Chief Rabbi Ephraim Mirvis visited the Vatican for a private audience with Pope Francis to discuss faith relations ahead of the 50th anniversary of Nostra Aetate, the seminal declaration of how the Catholic Church regards other faiths. During the visit, the Cardinal and Chief Rabbi spoke with the Holy Father about a wide range of topics. They told him about 'the friendship and warmth' in Jewish and Catholic relationships in the UK, and how much more they can be enriched. Even after 50 years of Nostra Aetate, Rabbi Mirvis explained that more can be done to integrate the teachings of the document in both communities. 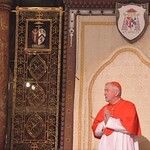 Cardinal Vincent agreed, saying there is a 'seam of riches yet to be mined'. They also discussed with Pope Francis their concerns about the refugee crisis and the persecution of people of faith, especially Christians, taking place today. In the article, they express their concern that expressing a belief in God 'no longer commands universal respect for a deep commitment to a lofty ideal, self-discipline and moral conviction' and instead people who express such a belief 'are more likely to be dismissed as naïve, unsophisticated and narrow-minded'. They explain that 'it is more important than ever for faith communities like ours to cultivate close working relationships' and the shared objectives of the faiths 'will be the antidote for negative views of faith that have crept into the world, and they will make clear its limitless potential for achieving greatness'. Pictured in the photo with Pope Francis and Cardinal Vincent are Chief Rabbi Ephraim Mirvis and his wife Valerie Mirvis.